The Brother MFC-L2740DW is a reliable and affordable all-in-one monochrome laser with an automatic document feeder of up to 35 pages for home or small businesses. 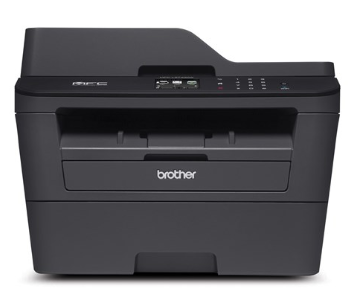 This compact, easy-to-use all-in-one has a 250-sheet tray, connects easily over wireless or Ethernet, and prints and copies up to 32 ppm. Automatic two-sided printing, plus scanning and two-sided copying in one pass. 2.7-inch color touch screen for intuitive menu navigation Print from compatible mobile devices on your wireless network Scan documents to a variety of destinations, including popular cloud services. Windows 10 / Windows 10 (x64) / Windows 8.1 / Windows 8.1 (x64) / Windows 8 / Windows 8 (x64) / Windows 7 / Windows 7 (x64) / Windows Vista / Windows Vista (x64) / Windows XP / Windows XP (x64) / Macintosh / Mac OS X (10.5 / 10.6 / 10.7 / 10.8 / 10.9 / 10.10) / Linux.